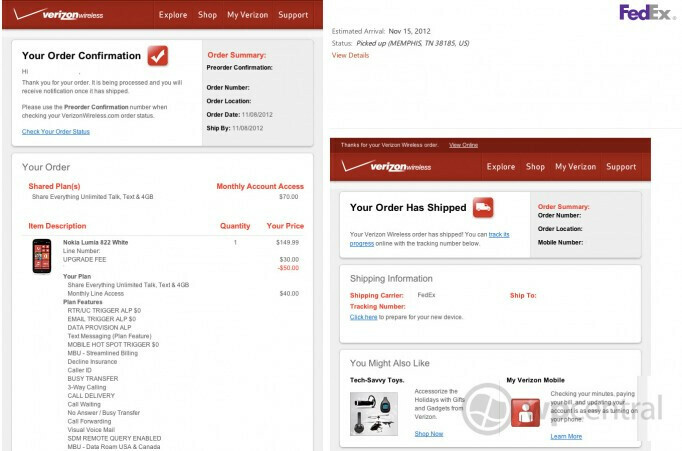 Confirmation emails sent to Verizon customers show that the Windows Phone 8 powered Nokia Lumia 822 has already been shipped. The confirmations show the delivery date for the device as November 15th, which happens to be this Thursday. There is some talk that the grey colored variant of the phone is not yet shipping because of some issues with supply, although this is just speculation at this point. 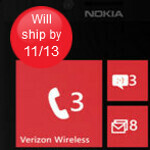 Verizon's web site shows the Nokia Lumia 822 shipping by November 13th which is today. Hooray for truth in advertising. The device is $99.99 with a signed two-year pact. The HTC 8X will ship by November 21st according to Big Red's web site, and costs $199.99 on contract. The Nokia Lumia 822 is a Verizon exclusive. It is similar to the Nokia Lumia 820 although the Verizon model offers a larger capacity battery at 1800 mAh vs. 1650, and a 1.2MP front facing camera against the .3MP shooter on the front of the Nokia Lumia 820. Microsoft is making a big push with WP8, as it tries to take on iOs @ Android, which has dominated the market. The company saw limited success with it's WP7, but hoping for a that more flexible redesign and promotion will boosts its numbers. i dont think so! it never has, had what diffrence will this make? i'm hoping windows phone's make up some ground. as a consumer, the more options i have the better it is for me. Ummm. Has nobody noticed the graphic on the home page for this article is what was originally put up for the story about the failed Google Play experience earlier today? Just sayin. I can't see the HTC 8X getting very many sales at a $100 more than the Nokia. I could be wrong, but it just doesn't look appealing. I meant to say the price doesn't look appealing, not the device itself.